Paintings and sculptures on display at the De Forest retrospective. 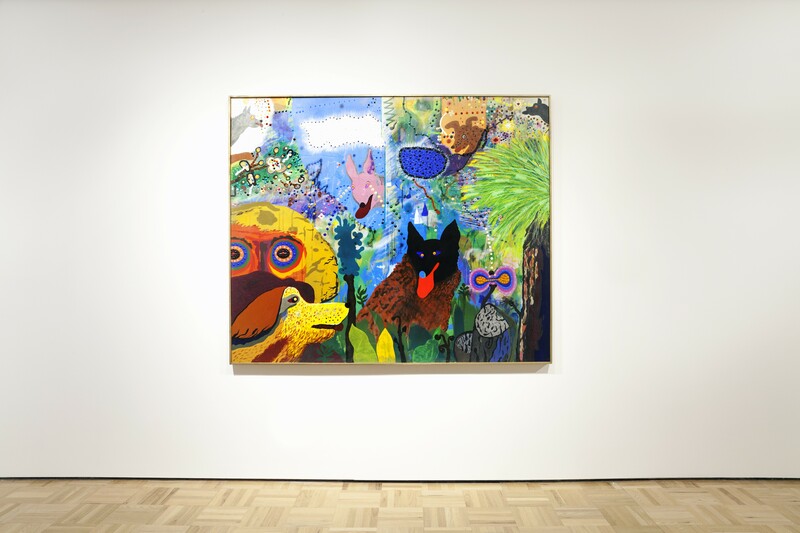 There is a listening station positioned in front of Roy De Forest’s 1974 painting “Hans Bricker in the Tropics” that offers two distinct interpretations of the work. One is by an adult, a therapist, and the other by a fifth-grade student. The therapist offers a dark, ominous analysis of the painting. But the child describes a man and his dog living inside a hollowed mandarin, with tears revealing the world outside their own. Fittingly, the young child’s take lands closer the artist’s spirit, which is delightfully on display at the retrospective Of Dogs and Other People: The Art of Roy De Forest at the Oakland Museum of California. The painter and sculptor De Forest’s childhood was itself the stuff of fantasy. Born in North Platte, Nebraska, in 1930, just as the Great Depression and its string of droughts and grasshopper infestations took hold of the Midwest, his family, including his four sisters and his parents, left their farm and headed west, eventually settling on a fruit farm in the Yakima Valley in Washington. After studying art at Yakima Valley Community College, De Forest moved to San Francisco in 1950, to continue his education at what is now known as the San Francisco Art Institute. At the time, San Francisco was the West Coast epicenter of Abstract Expressionism, the post-World War II art movement more clearly defined in its opposition (anti-figurative art, anti-neat, and unchallenging abstractions) than its embrace of an undeviating aesthetic. De Forest and his peers eventually found too serious the movement’s absolute morality and its “flagrant disregard for matters of technique and taste,” as Susan Landauer, lead curator of the retrospective, explains in the exhibition catalog. Soon enough, the young artist found his own voice, which turned out to be more playful in its irreverence. After spending time in the Bay Area and teaching at his alma mater in Washington, De Forest settled as a professor at UC Davis in 1965, where he stayed until he retired 27 years later. There, surrounded by likeminded artists, including Wayne Thiebaud, William T. Wiley, and Clayton Bailey, he was part of the Nut Art movement, which De Forest defined as “a squirrel in the forests of visual delights,” in a written statement for CSU Hayward in 1972. Specifically, the artist was a squirrel, occasionally interacting with his audience, but mostly finding odd objects and hoarding them frenetically. 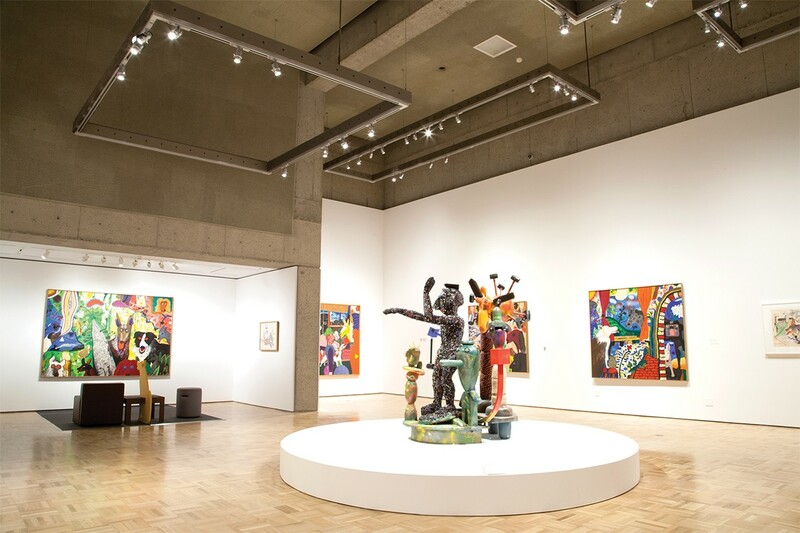 This frantic archiving lends itself to the maximalist, assemblage style present in almost all of De Forest’s paintings and sculptures on display at the Oakland Museum. Many of the artist’s canvases are textured by his signature “Hershey Kiss” paint drops in a pattern reminiscent of the stitching on quilts (the artist’s mother often made her son quilts and shirts). Inside his paintings, colors float brightly on top of other colors while humans and other creatures go on about their lives in De Forest’s strange landscapes. The frames of these paintings could stand alone as sculptures, and like the actual De Forest’s sculptures on display, they are extensively adorned with anything from household cleaning brushes, to figurines, beads and, at the very least, a pattern of some sort. Of Dogs and Other People also prominently features canines, of course, but De Forest’s dogs are not a coy accessory to man. They smile with their tongues out, hide, jump, and emanate colorful waves of energy from their mouths. This playfulness is ubiquitous in the De Forest work, a theme highlighted intentionally by Landauer and associate curator Christina Linden. The retrospective, the first of De Forest’s work, comes almost exactly ten years after he passed away in Vallejo in May of 2007. Linden told the Express that one of the audiences they kept in mind while putting together the show, which has been in the works for nearly three years: families, especially those with young children, and local students, whose field trips to the museum are a formative East Bay experience. This focus is most obvious in a tactile felt room, where a De Forest painting comes to life. 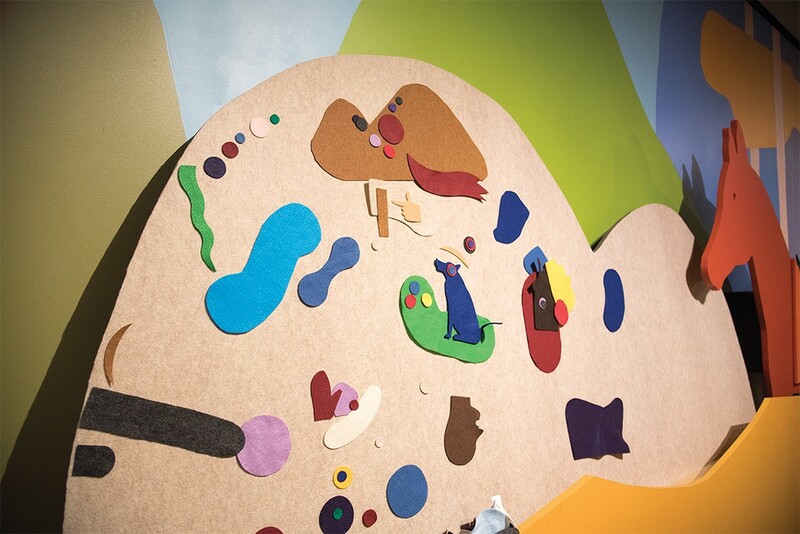 Though the room was created by exhibition designer Craig Hansen with children in mind, it is a wonderful trip for all-ages, anyone who would find pleasure in living inside a De Forest painting and re-arranging the artist’s signature shapes and colors. The felt room at the exhibition was designed by Craig Hansen. Linden also described the exhibit as for “anybody who’s interested in art, but feel[s] like they’re not well-seasoned in it.” The curators arranged the exhibit in non-chronological order, so visitors instead engage De Forest’s works in themed areas, inspired by children’s literature — the experience is like being lost in De Forest’s whimsical world — if only for a moment. “The possibility for really letting yourself imagine alternatives in a serious way, a highly-dedicated way, was really interesting to us,” Linden explained. Indeed, Of Dogs and Other People is a fitting temporary escape from the strange and warm days ahead. Of Dogs and Other People: The Art of Roy De Forest will be on view at OMCA (1000 Oak St.) through August 20. Free–$15.95. MuseumCA.org.